…the concept of ministry personified by Jesus is diakonia, a ministry of service. Acts of the Apostles (6) offers one record of the establishment of the early church diaconate. Faced with the competing demands of the responsibilities of supporting congregations and serving the needs of the outcasts and marginalized, the elders decided to divide the work into two streams. A group of deacons was established to do the latter work. Stephen, one of them, was soon killed for his political advocacy for the poor. In Romans (16) Paul’s naming of Phoebe as deacon makes it clear that women, as weIl as men, were acting as deacons in the early church. Women deacons played an equal role to the men in the very early church, but a patriarchal hierarchy emerged and a second expression of ministry, that of “Deaconess” was created. 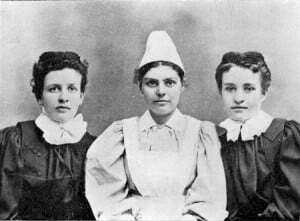 Women were restricted to ministering to other women. For men the role of Deacon became a temporary stop on the path to priesthood. By the 600s in the western church the diaconate disappears. Over the centuries movements of women and men committed to charity and social justice arise, but are suppressed. …In the 1800s the social and political conditions are right for the re-establishment of the diaconate for men and women, but it is the groups for women that prosper. The continental Orders spread to Great Britain and it is the pattern developed there, first arriving in the United States and then on to Canada, that is formative for the United Church’s diaconate. See also a more in depth history of the early and restored diaconate. 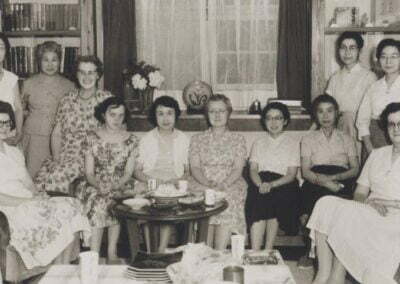 Deaconess Daphne Rogers (left end of couch) was on the teaching staff of Toyo Eiwa school for girls in Japan. She served in Japan from 1959 until her retirement in 1994. 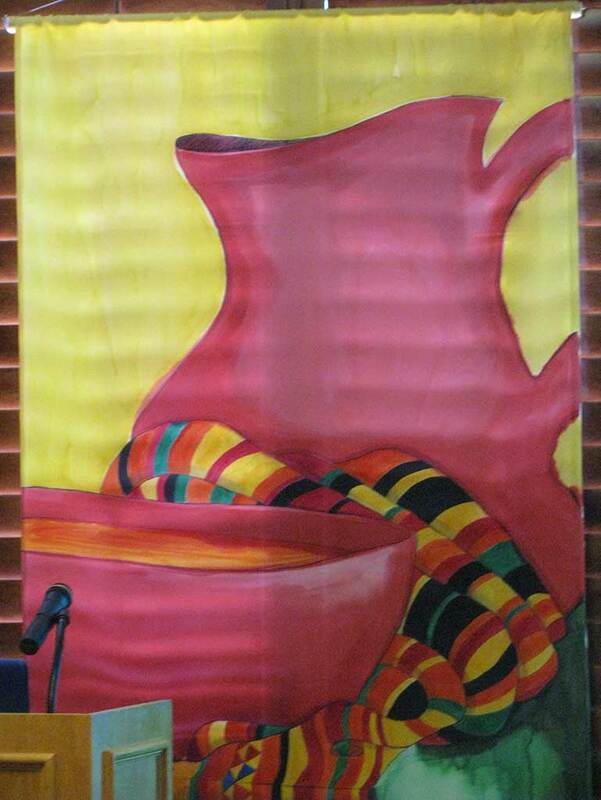 The jug and bowl is an ancient symbol of the diaconal ministry of service. Banner from Diakonia of the Americas and the Caribbean 2011. Artist Amanda Hunter, United Methodist (US) Photo courtesy of Sharilynn Upsdell. 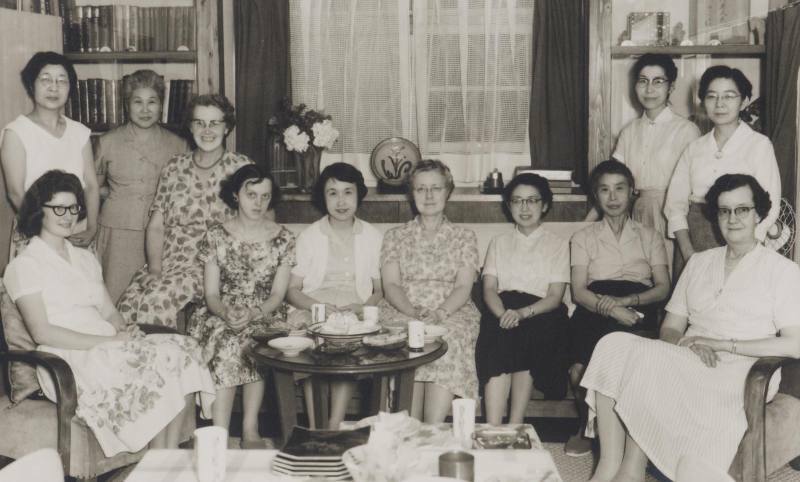 After the United Church Order was created in 1925 the expectations of Deaconess work expanded as women were increasingly appointed to serve congregations, frequently in remote locations. Women were ordained starting in 1936, but their numbers were very small. It was Deaconesses who took the ministerial role, although they were definitely classed as laity. 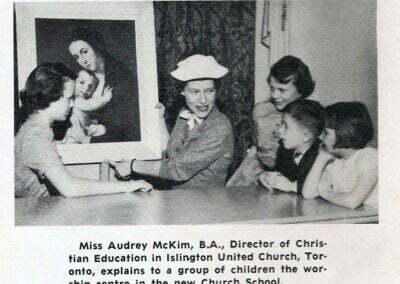 Formative in the history is the work with children in religious education, particularly in the post war baby boom years and the days of Sunday schools with upwards of 2,000 children! The demand for Christian Education Directors in the 1950s was insatiable. Later work with adults and education for social justice work grew in prominence. The modern era era brought new understandings of the role of women in church and society. 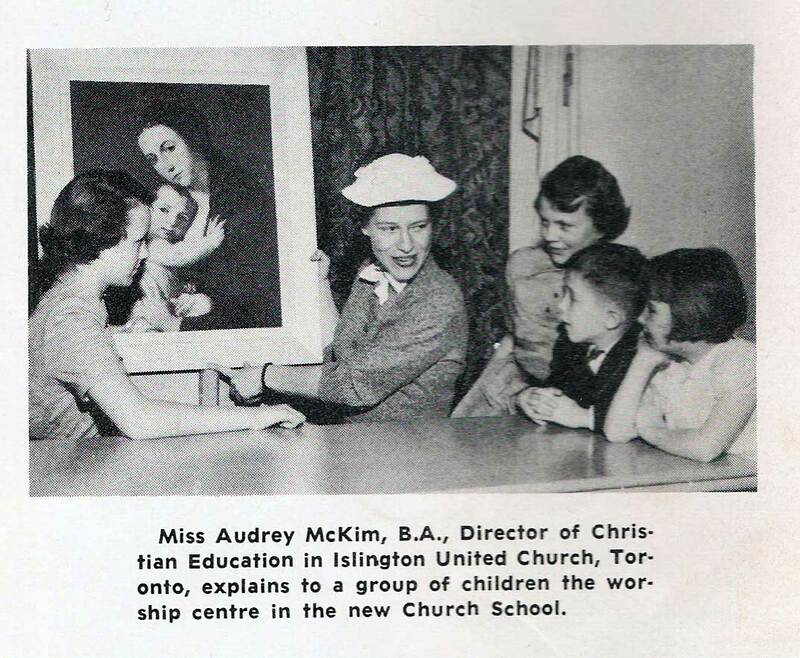 Starting in the 1960s the rise of the 2nd wave of feminism, along with new approaches to adult education, a major reformation on how the United Church viewed mission, and an increased commitment to making systemic social change all affected the shape of diaconal ministry. Deaconesses became members of Presbytery and a new category of Certified Churchmen was created. Then after several years of discussion and debate, a new expression for the diaconate resulted: Diaconal Ministers. 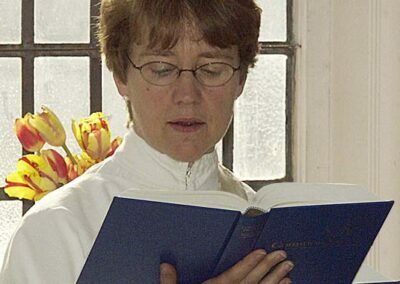 The Order of Diaconal Ministry, established in 1982, is open to women and men and is one of two equal expressions of Ordered Ministry in the United Church. Diaconal Ministers are commissioned to Education, Service and Pastoral Care in the same manner that those called to Word and Sacrament are Ordained. In 1984, DUCC was begun as a voluntary association of United Church of Canada Diaconal ministers. The Presbyterian Deaconess Alumni Association began in 1916 followed by the Methodist Association Deaconess Association in 1923, and an Association continued with the formation of the United Church Order. The voluntary associations have provided a way for members to stay connected, develop a sense of identity and advocate for recognition and better working conditions within the institutional church. Membership is open to all those who consider their ministry to be diaconal. DUCC is a member of DIAKONIA World Federation and its regional body Diakonia of the Americas and the Caribbean, taking its place in a global, ecumenical movement of women and men called to a ministry of service in the world. 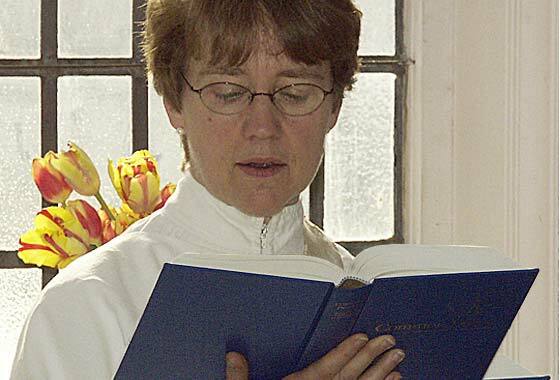 A Deacon in the Anglican Church of Canada for over 30 years, Maylanne Maybee is Principal of the Centre for Christian Studies, an ecumenical school focused on diaconal education. Diaconal Ministers Marly Bown right and David Kai (left) Youth Leaders for General Council Youth Forum 2012. The youth (about 75) were a part of a flashmob on Parliament Hill before Moderator Mardi Tindal addressed the crowd.